This year, after the fantastic success of 2017 edition, the Executive Board has chosen to continue in the process of defining the indications of EUS in clinical practice and finding consensus on debated topics. This year Cyst Neoplasm of the Pancreas diagnosis, treatment and follow up will be strongly presented and discussed by some of the most important experts on the field worldwide and we will try to reach to a consensus on the best management of these neoplasia. Furthermore you will be extensively exposed to live cases transmitted from the Pancreato-Biliary Endoscopy and Endosonography Division of the Pancreas Translational and Clinical Research Center, from the Florida Center of Interventional Endoscopy and the Asian Institute of Gastroenterology, two of the most renowned Endoscopy Centers all over the world. EURO-EUS Faculty will perform all the different diagnostic and therapeutic endoscopic and EUS procedures indicated in pancreatobiliary diseases. Like during the past edition, we have scheduled an HANDS-ON TRAINING PROGRAM that, following the sold out session organized last year, has been divided in two sessions covering the whole day, allowing to a higher selected number of participants to improve their EUS skills under the supervision of a Team of Trainers. Please register on register now page. Vai realizar-se no dia 23 de maio o I Curso Básico de Ecoendoscopia organizado pelo Serviço de Gastrenterologia Centro Hospitalar S. João / WGO Gastroenterology and Hepatology Training Center Porto. O Curso tem o patrocínio científico do GRUPUGE e da SPG. Faça a sua inscrição através de geral@grupuge.com.pt. Consulte o programa: clique aqui. 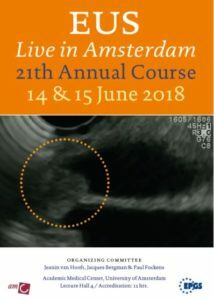 The 21st edition of EUS Live in Amsterdam is one of our longest running courses. We select our “standard” EUS-cases like we do the all through the year. We use different instruments and needles and we discuss and discuss and discuss all different aspects of EUS. We also have an on-site cytologist who shows immediately what we have given him. And this all in a very collegial relaxed atmosphere. We hope this course will offer you an opportunity, maybe together with your EUS-nursing staff, to discuss the indications, technique and interpretation of images of still one of the most challenging endoscopic procedures, EUS. We look forward to seeing you (again) in June 2018 in Amsterdam. The ​objective ​of ​this ​event ​is ​to ​provide ​participants ​a ​comprehensive ​education ​in ​Inflammatory ​Bowel ​Disease ​evaluation ​and ​management. ​The ​program ​covers ​six ​major ​topics. Treatment ​options ​for ​the ​medical ​management ​of ​ulcerative ​colitis ​and ​Crohn’s ​disease. Understand ​the ​role ​of ​surgery ​in ​the ​management ​of ​complications ​of ​Crohn’s ​disease. How ​to ​evaluate, ​manage ​and ​monitor ​treatment ​of ​patients ​with ​IBD. Management ​of ​IBD ​in ​women. Diagnosing ​colon ​dysplasia/cancer ​in ​IBD ​patients ​and ​use ​of ​chromoendoscopy. Peri-operative ​management ​of ​IBD. Polish Ultrasound Society invites the ultrasound community to Poznan on 6-9 September 2018 to the ultrasound Congress EUROSON 2018. The Congress will be held in the Congress Centre of the Poznan International Fair, Głogowska 14, 60-734 Poznan. The Poznan Congress Center is located in the city center of Poznan, within walking distance from the railway station, numerous hotels and 7 kilometers from the Airport Poznan-Ławica. Convention center has a high standard meeting rooms, modern audio-visual facilities, recreation rooms and parking for 2000 cars. Congress EUROSON 2018 will be held simultaneously with the XIV Congress of Polish Scientific Society of Ultrasonography. The substantive part of the Congress EUROSON 2018 will include the presentation of all the applications of ultrasound in modern diagnostic imaging – on the lectures, plenary sessions and ultrasound training workshops. During the ultrasound apparatus and equipment exhibition, new technologies and programs in sonography will be presented, a rich social part of EUROSON Congress 2018 will enable recreation, socializing and experiencing Polish hospitality. EUROSON Congress will take place in Poland for the second time. In 2002, in Warsaw, we had the opportunity to host a big part of world and Polish ultrasound community. 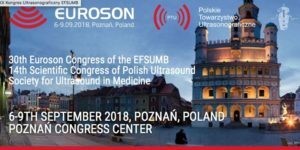 Polish Society of Ultrasound, the organizer of the Congress EUROSON 2018 invites all ultrasound enthusiasts from around the world to Poznan in 2018. 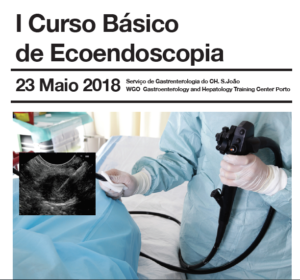 Centro Hospitalar de S. João, Porto 23-24 Nov 2018 The course will be focused on the gastrointestinal applications of contrast-enhanced ultrasonography (CEUS). It has been designed considering as target participants Gastroenterology residents and specialists with interest and some experience in digestive ultrasound. Registration limited to 25 participants through the SPG secretariat. Registration Deadline: october 9th Preferential conditions: previous experience in abdominal ultrasound and order of arrival of the enrollment. Programme: click HERE. Realizou-se nos dias 6 e 7 de dezembro o 15º Curso Teórico Prático de Ultrassonografia para Gastrenterologistas no Hospital Amato Lusitano, em Castelo Branco sob a coordenação da Dra. Ana Caldeira e Dr. Eduardo Pereira. Veja algumas fotografias do curso. 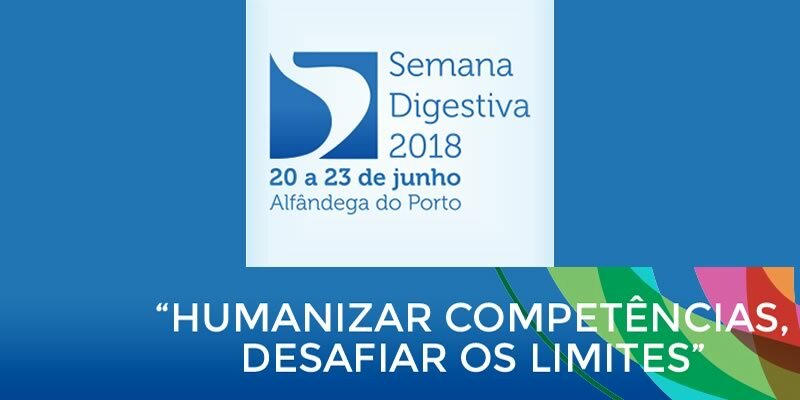 O GRUPUGE vai realizar no dia 15 de fevereiro de 2019, em Ponta Delgada, o “Simpósio de Ecoendoscopia: do avançado ao básico”. Consulte o programa definitivo: clique aqui. Inscrições: clique aqui.